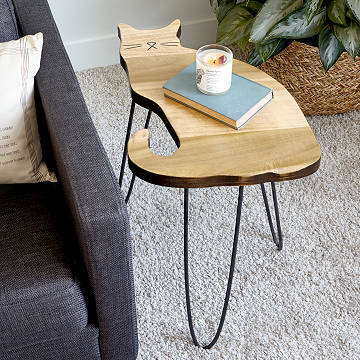 Crafted from reclaimed poplar wood, this rustic table pays homage to your loyal couch nap partner. Always snuggled by your side—that’s your kitty. This rustic table pays homage to such a loyal couch nap partner. Crafted from reclaimed poplar wood, each is hand-sanded with delightful whisker detail. It's hand-finished with a contrasting stain along the edge, and sturdy-yet-stylish iron legs mean it'll last through plenty of purr sessions to come. Made in Pilesgrove, New Jersey.